The Kitchen Coven | Where secrets are kept, problems are solved, hearts are fixed and family is made. Where secrets are kept, problems are solved, hearts are fixed and family is made. I’ve had this set of coffee mugs since 2008. They came with my first “grown up” plate set I ever bought back when I bought my first house. I never use them because I prefer to use my designer Starbucks coffee mugs but I’ve kept them around for 11 years because I like their color but there’s probably some sentimental reasons behind that too. There’s something strangely therapeutic in breaking something…on purpose. I have an exciting post for you all this evening. Not only is it my first Youtube video but it’s also about information that I found fascinating. Instead of writing it all down into a very wordy blog post please view my very first Youtube video below! http://www.Dripdepot.com for dripper line supplies. I hope this post helps you to make your rain barrel more user friendly. I’m really excited about this set up and hope it will help keep my garden hydrated throughout the year! Once a year I get the pleasure of looking out my master bedroom doors to my cherry blossom tree. Not only is it the largest tree on the block but it’s the earliest blooming cherry blossom tree (since my back patio is surrounded by concrete it’s abnormally warm for the area). I love this tree so much. Not only does it create shade & greenery to my Urban landscape but it gifts me with beautiful pink flowers every year. This year I did something I always wanted to do: I made a preservative with the cherry blossoms. I went out back & gathered as many cherry blossoms from standing height as possible…& I was pretty proud of myself too! It took all evening! It took a long time to gather this cute little pile! Every morning while drinking my coffee I like to gaze out into my garden & watch the city birds. I never thought that I would enjoy bird watching but I’ve always liked to listen to their chirps so watching them was a natural progression. Red Wing Blackbird. First time I ever saw him. It’s been a long time! Long time no see! I’m back to blog AND I got my domain name back! I’ve been kicking around the idea to bring back the blog for awhile now but my domain name was taken for the past year. Today, on a whim, I decided to check again AND IT WAS AVAILABLE! Unfortunately, I lost about 50% of my posts when I didn’t renew my hosting way back when and I’m working on trying to collect those posts from internet archival sites. Also, when I imported my blogger posts to WordPress for some reason i lost all my photos but I do have them somewhere so I may go back to my external harddrive and pull them up again. We shall see. The important thing is I’m back and ready to get to writing! 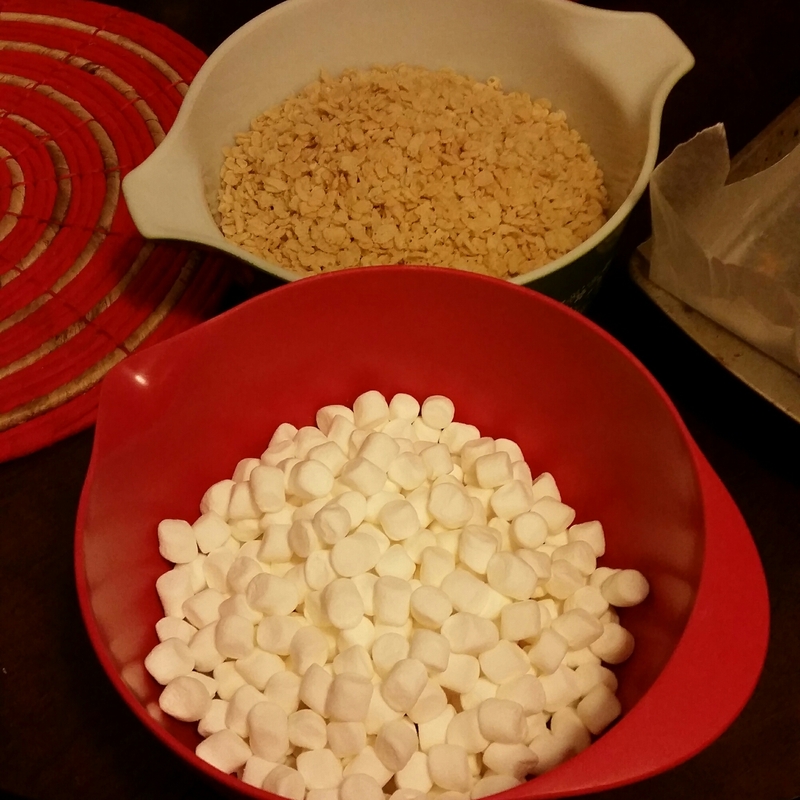 I haven’t made rice krispy treats in years. It was for Thanksgiving five years ago and they were Pumpkin Spice Rice Krispies. They were delicious but I haven’t made krispies since. Yesterday was Rico Suave’s sister’s birthday and I wanted to bake her something special but we didn’t have a whole lot of time at the beginning of this week to do anything too intricate. I immediately thought of krispies. I wanted to make the krispies special to her and her personality since it was her birthday gift. I have set up The Kitchen Coven on a new blog host. Google had somehow tagged me as “inappropriate” and therefore were not spidering my posts. This meant that unless someone knew exactly what to write in a search bar, they were not being directed to my website. Because of this, I have decided to set up The Kitchen Coven with WordPress.org though DreamHost.com. I was able to successfully transfer all my old blogs, future scheduled blogs, and comments to the new host. This also means that I now own the domain name The Kitchen Coven (YAY) and it is an official “website” www.thekitchencoven.com (YAY)! What does this mean for you? Well it doesn’t really mean anything unless you signed up to get subscription emails. If you signed up for subscription emails, you will have to resign up at www.thekitchencoven.com. That is it! I hope to continue our love affair for non-corporate food on a much freer and friendlier forum! Coco Rico is a coconut soda from Puerto Rico. Now, I don’t drink soda but I was extremely intrigued. I grabbed it and bought it. I immediately though of rum. I knew that this soda would go great with some rum. I brought it home and opened a can to taste it. It is *very* sweet. Yes, the soda is made with high fructose corn syrup; yes, it has even more sugar, however I do not drink soda everyday and indulging in something different once in a blue moon is not a bad thing. Even though the soda is very sweet the coconut flavor was there and it was very delicate. I knew that it would go great in a mixed drink. A mojito to be exact. A traditional mojito is made by muddling mint, lime, and sugar together until the lime extracts it’s juice. Add 2oz of white rum, add ice and top it off with sparkling water. Since the Coco Rico was so sweet, I decided to forgo the sugar. I muddled a few mint leaves with half a thinly sliced lime, added 2 oz white rum, added ice, and topped off with Coco Rico. The drinks were absolutely delicious! The Nutless Wonder wants some! Enjoy your Coco Rico Mojito on the porch! Be sure to wear your hat! In a small collins glass, muddle lime with mint until the lime extracts all it’s juice. Add ice and rum. Top off with Coco Rico. Pour the drink from the collins glass into another glass. Pour from one glass to another to mix the drink well. Serve in small collins glass. I love bell peppers but I can’t eat them raw so I don’t buy them often because of that. Which is a shame, really, because bell peppers add a lot of flavor to salads and can be a great snack. I read Marc Matsumoto’s blog “No Recipes” (and you should too! His recipes are amazing!) and one day I received a post about “Grapefruit Pickled Peppers” and was very intrigued. I read through the recipe and I had to try the method immediately. This method makes a very crisp, marinated pepper that you can eat right out of the jar. Marinating the peppers in a citrus juice “cooks” the peppers as the acid will break down the fibers a little bit. I have been eating these peppers almost everyday in an afternoon snack salad. I hesitate to call these peppers “pickles” because technically they are not pickles, so I call them “marinated” peppers. In Marc’s recipe, he uses grapefruit juice but I had some orange juice from making the Carne Asada, so I stuck to his method but used orange juice instead. I also didn’t have any fresh cilantro on hand. Knowing that cilantro has a peppery flavor, I used dried celery and peppercorn that I had. I also didn’t have lemon juice on hand so I used a dried lemon rind with the pepper. In a quart jar add the dried celery and peppercorn. Slice the pepper and stuff it in the quart jar. Stuff the bay leaf and dried lemon rind in with the peppers. Pour the orange juice over the peppers. Cover and refrigerate. Use within 2 weeks. Knowing How to Can Rocks! Knowing how to can rocks! Learning how to can really opened my eyes to a whole different aspect of cooking and I’ve learned so much from it. It also taps into my cheap skate side in that I can take advantage of sales.